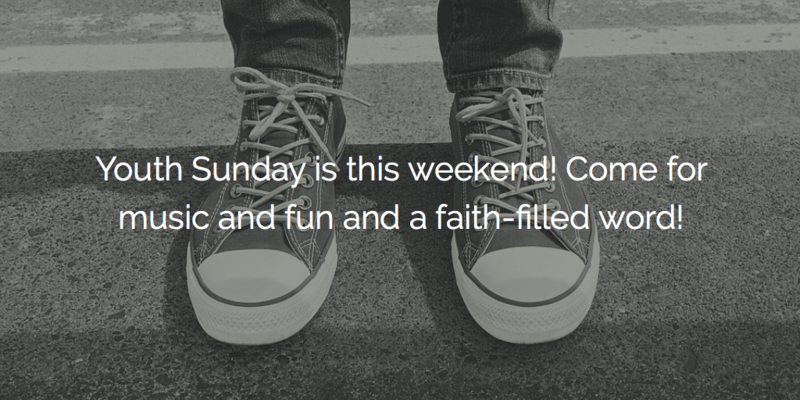 This Sunday is Youth Sunday, a day when the younger members of our community will share their faith and perspectives. 3“Happy are people who are hopeless, because the kingdom of heaven is theirs. 4“Happy are people who grieve, because they will be made glad. 5“Happy are people who are humble, because they will inherit the earth. 6“Happy are people who are hungry and thirsty for righteousness, because they will be fed until they are full. 7“Happy are people who show mercy, because they will receive mercy. 8“Happy are people who have pure hearts, because they will see God. 9“Happy are people who make peace, because they will be called God’s children. 10“Happy are people whose lives are harassed because they are righteous, because the kingdom of heaven is theirs. 11“Happy are you when people insult you and harass you and speak all kinds of bad and false things about you, all because of me. 12Be full of joy and be glad, because you have a great reward in heaven. In the same way, people harassed the prophets who came before you. Besides, helping others by providing basic carpentry skills at Sierra Service Project each summer, participants also take part in some community building and Bible study activities. One activity that we did at the Tsaile, AZ site was to think about who are the marginalized in our society or even just our own little world and how did we think the group / individual should be blessed. Bringing that back, we did the same thing in Sunday School. Here are a few answers from our class that ranges from 4th graders through high school are students. Blessed are the bullied; for they shall find their strength. Blessed are the hungry; for they shall never starve. Blessed are the outsiders; for they shall be included. Blessed are the clumsy; for they shall find their space. Blessed are endangered animals; for they shall be protected. Blessed are the soft spoken (quiet); for they shall find their voice. Blessed are those on the street; for they shall find shelter. Blessed are the scarred; for they shall be healed. Blessed are those who are lost in darkness; for they shall find the light. Bless the bullies; for they shall find kindness. Who or what do you think should be on this list? You will have a chance to share yours and hear from a few others about what they would include. Still curious about the sermon title? You will have to come and find out about the Disney songs and John Wesley.